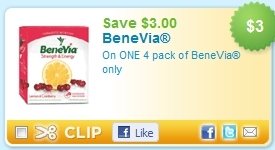 There is a new high value $3/1 coupon for BeneVia 4 pack. Last time they had this coupon I was able to score this for free at Pathmark when it went half price. I don’t see it on sale now right now but if you use product you may want to hang onto it for a good sale. Home Depot Garden Club Coupons: $4 Off Miracle Grow, $2 Off Smart Seed Product & More!